Last week, Charlie and I had the pleasure of attending the Opening Ceremony of 2018 Huangshan Tourism Festival & 7th Anhui International Travel Agents Conference held in Huangshan City and we had an unforgettable whirlwind tour of Huangshan. During this Huangshan inspection tour, we explored not only the must-sees of Huangshan like the Yellow Mountain, but also lesser-known spots which are equally breathtaking. Bordering Zhejiang and Jiangxi provinces, Huangshan is easily accessible by high-speed train from Shanghai (over 4 hours) and Hangzhou (about 3 hours). According to the official, the Huangshan-Hangzhou high-speed railway will be open next month. At that time, it will only take 2.5 hours to travel from Shanghai to Huangshan by bullet train, and 1.5 hours from Hangzhou to Huangshan. The first day tour was to visit 4 old villages in Yi County of Huangshan City: Hongcun Village, Lucun Village, Pingshan Village, and Xidi Village. 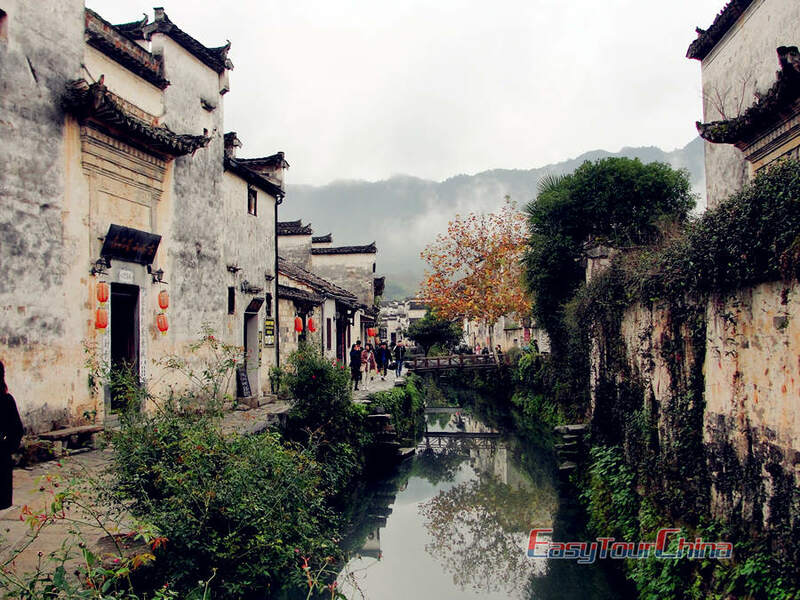 The UNESCO listed Hongcun and Xidi old villages are the best representatives of ancient Hui-style dwelling architecture. They are so famous that there are still many tourists in low season. Luckily, our experienced tour guide knew how to avoid the crowds and shared lots of cultural backgrounds with us while visiting different ancient houses. Lucun Village, only several minutes’ drive from Hongcun Village, is a small tranquil village with exquisite wood carving. It has few tourists during our visit and we saw villagers cleaning fish by the small river and working on the vegetable field. Pingshan Village is also a less popular village, so there are not many regular tourists. But you can see many art students there painting. The next day we went to the majestic Yellow Mountain (Mount Huangshan), one of the most beautiful mountains in China. We took the Yungu cable car up to the Mountain, toured some of the highlights of the “back mountain” part (which is less crowded compared with the front mountain scenic area) and the West Sea Grand Canyon. Unfortunately, it is a rainy and foggy day and we were unable to admire its spectacular mountain view. But we did see one of the wonders of Yellow Mountain – the Odd-shaped Pines. Hope I can get back here again soon on a sunny day. 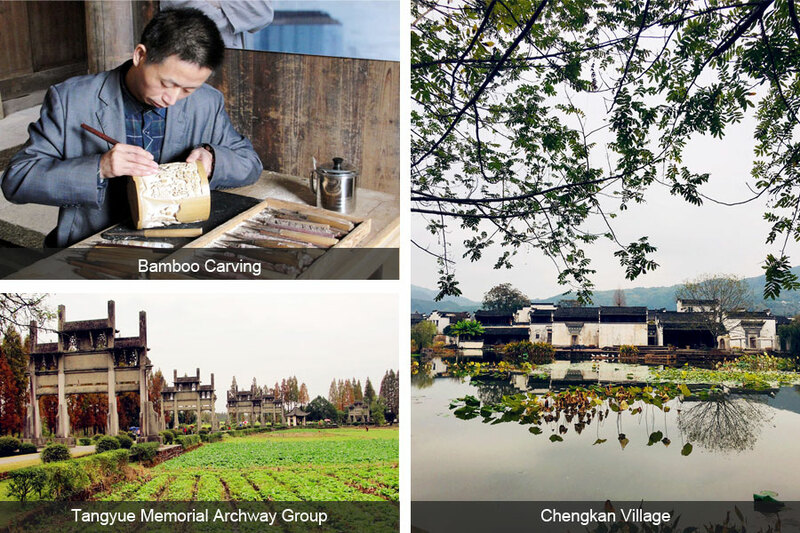 We continued to head to Huizhou District and She County to explore the Hui-style Carving Museum, Chengkan Village, Tangmo Village, Tangyue Memorial Archways and Bao's Family Garden. This day is also full of surprises as we were amazed by the fantastic ancient carving craftsmanship, the knowledge of arranging a village base on Chinese Feng Shui, and the rich and profound Hui culture. When visiting Huangshan, except for visiting the beautiful Yellow Mountain and historically and culturally important sites, you will also have the opportunity to meet locals, and hike through the picturesque rural villages, as well as take part in hands-on activities like making your own Chinese brush pen and picking Huangshan Maofeng Tea leaves. 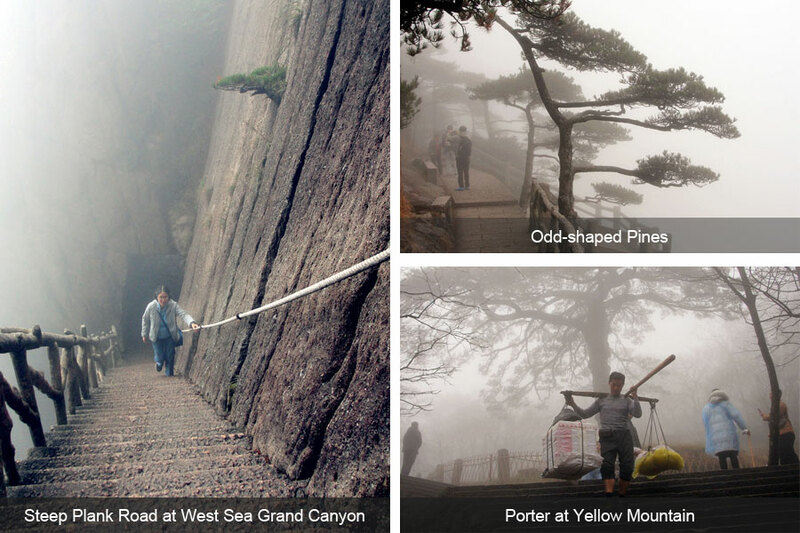 Trust me, visiting Huangshan is really a once-in-a-life time trip and some spots here are still under the radar. Don’t hesitate to contact us to tailor your own Huangshan tour based on your pace and preference. Or you can simply make an inquiry by using the form below.